Hey teachers - are you looking for free financial education resources that you can use in the classroom? Here are five great resources that you should check out. On DFI’s financial education clearinghouse you will find links to resources and curriculum by grade level (K-12), as well as updates regarding financial education in Washington. The Financial Education Public Private Partnership brings together members from the public and private sector to bring quality financial education to students of Washington public school districts. On their website you will find curriculum and resources that has been reviewed by the partnership. 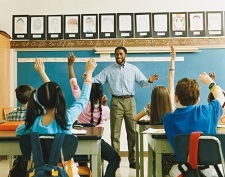 The Council for Economic Education focuses on economics and financial literacy education by providing economics education resources to teachers and students. On their website EconEdLink you will find curriculum, games, and more. Search the Jump$tart Coalition Clearinghouse to find curriculum, games, and activities for the classroom. The FDIC’s Money Smart for Young People series features four free age-appropriate curriculums that are designed to promote financial understanding in young people. Money Smart for Young People curriculums are available for: Grades Pre-K-2, Grades 3-5, Grades 6-8, and Grades 9-12.